Despite killing the Thunderbolt Display without a replacement this week, Apple is still working on a successor— one that will reportedly have its own separate integrated graphics card, likely to push a high-resolution Retina display. 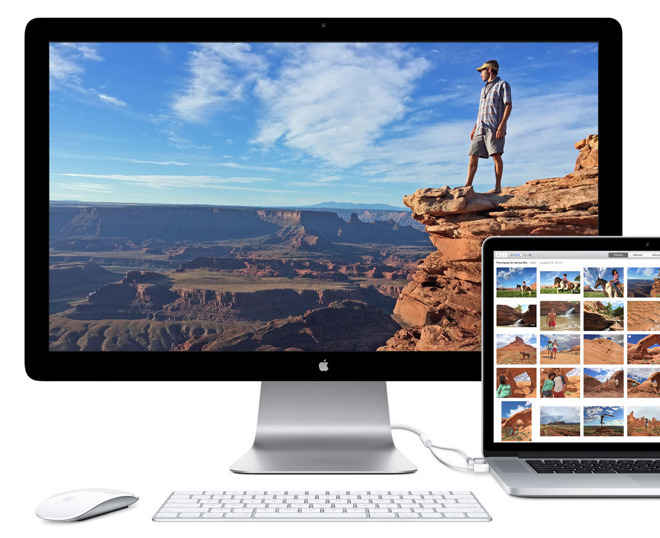 Citing unnamed sources, John Paczkowski of BuzzFeed tweeted on Friday saying Apple is in fact still working on a new external display that will serve as a successor to the Thunderbolt Display. The rumor comes less than a day after Apple unceremoniously discontinued the hardware, advising prospective buyers to consider "a number of great third-party options available for Mac users." While some took the announcement as a sign that Apple was planning to exit the display business entirely, Friday's report suggests that Apple instead plans to come back stronger, with an integrated GPU that could allow lower-powered machines, like the 12-inch MacBook, to still operate properly with a large Retina display. Incorporating a GPU capable of driving ultra high-resolutions would theoretically ensure compatibility with almost any modern Mac, and would allow Apple to put out a monitor equivalent to the 5K Retina display found on the company's high-end 27-inch iMac. The Thunderbolt connector found on modern Macs is technically capable of carrying enough bandwidth for an external GPU, which some Windows PC makers have taken advantage of to turn portable laptops into gaming powerhouses when docked. The fact that Thunderbolt can support external graphics cards has also led to some unofficial workarounds among Mac enthusiasts, using some of the infrastructure Apple has built to support external PCIe devices for professionals. But doing so requires some nontrivial hacking to enable Thunderbolt GPU drivers, and the result remains buggy. One hold-up for launching new hardware could be the type of port the rumored hardware will use. Apple is expected to launch a redesigned MacBook Pro later this year with smaller USB-C ports replacing the full-size legacy USB ports found on current models. If those USB-C ports were capable of transferring data at Thunderbolt 3 speeds, a new external monitor from Apple could theoretically take advantage of those capabilities.